By Joshua Gillin, Amy Sherman on Tuesday, December 30th, 2014 at 11:21 a.m. If his campaign promises are any indication, Florida is getting a different Gov. Rick Scott in 2015 than the one it got in 2011. 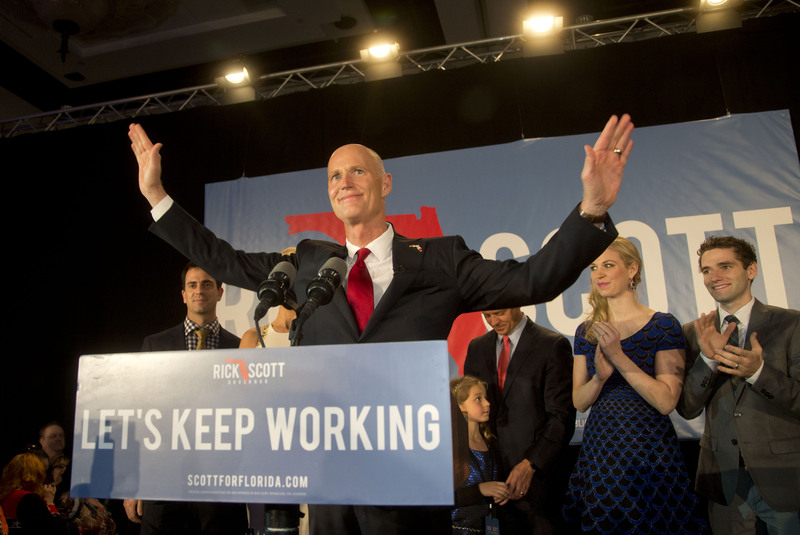 In 2010, Rick Scott ran on a platform of growing jobs, downsizing government, drug testing welfare recipients and cracking down on illegal immigration. In 2014, he still made job growth his mantra and promised more tax cuts, but Scott also highlighted softer goals of improving education and the environment. While we’re still tracking Scott’s first-term promises -- including the outcomes of promises about his 7-7-7 Plan to implement a seven-point economic plan to create (by Scott’s own count) 1.7 million jobs over seven years -- it’s time for an update. Scott will be sworn in for a second term on Jan. 6, so we are adding 20 promises to the Scott-O-Meter. During Scott’s first term, we tracked 57 promises, rating 24 as Promise Kept, 15 as Promise Broken and 11 as Compromise. Another five are In the Works and two are Stalled. PolitiFact rates promises based on outcomes, not a politician’s intentions, so if a promise is not achieved we rate it a Promise Broken. We’re looking to hold elected officials to their word, tracking whether they keep the promises they make as candidates. In 2014, Scott made a series of pledges on tax cuts that he claimed would ultimately total $1 billion. Scott said he would eliminate the state’s manufacturing tax and phase out taxes on commercial leases. He also promised to propose fashioning a constitutional amendment to prevent property tax increases if a home’s value stays the same or declines. That last one would require the approval of 60 percent of Florida voters to become law. After initially suggesting $3.3 billion in cuts to education spending his first year, Scott is now looking to grow the state’s school budget. He has promised to ask the Legislature to double investment in digital learning initiatives to $80 million, make Florida No. 1 in higher education affordability, raise per-pupil spending and make the state tops in student performance and high school graduation rates. On the environment, Scott has proposed a 10-year plan to sink $1 billion into protecting Florida’s waterways (he won’t be in office for six of those). Those promises include building a foundation for springs improvement, expanding funding to restore those springs, increasing Department of Environmental Protection penalties for polluters and creating a $2 million state park improvement grant in order to win a fourth national gold medal. That’s a sea change from just two years ago, when Scott canceled a springs restoration program originally started under Jeb Bush. His administration has overseen drastic cuts in DEP funding and eased permitting rules. Environmental advocates say his plan doesn’t deal with the root causes of fouled springs, like nutrient pollution and overdrawing water, which would require legislation. Scott also is not addressing the dangers that climate change poses to the state, but has said he wants to expand business programs and spend $25 billion on roads. Many of Scott’s promises are couched in terms of asking lawmakers to address something, an approach that may hit a wall with the Legislature. Scott defeated former Gov. Charlie Crist by only 64,000 votes, so it’s possible the Republican-led House and Senate may not feel they have to prioritize their governor’s newfound priorities, no matter how populist they may be. Expect to see some of these proposals to appear when the governor submits his proposed budget to the Legislature in February. The Scott-O-Meter will be watching closely.